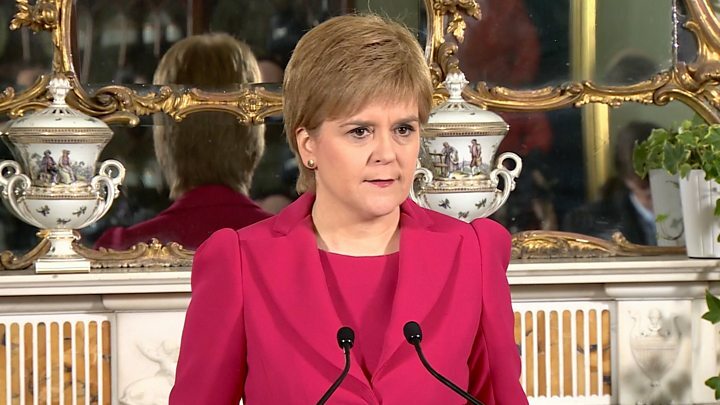 Plans for a second independence referendum "must be made in Scotland", Nicola Sturgeon has said. Speaking after a meeting of her cabinet, the first minister said details of the vote should be shaped by the Scottish Parliament. 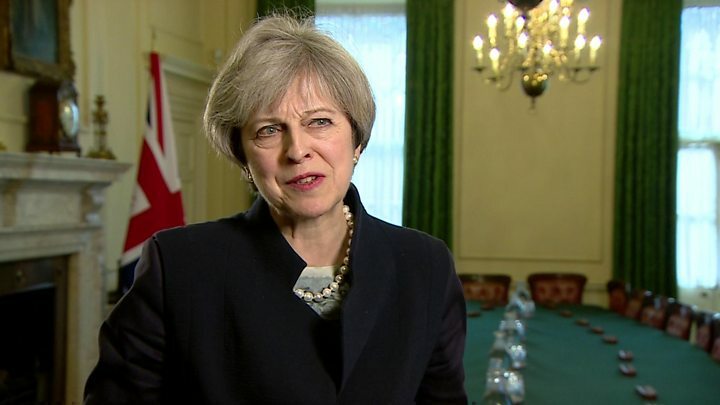 UK Prime Minister Theresa May is considering how to respond to the demand for a referendum. There has been speculation she will seek to delay the vote until after the Brexit process is complete. Speaking after the cabinet meeting in Edinburgh on Tuesday, Ms Sturgeon said there should be no "blocking mechanisms". Laura Kuenssberg: What are Theresa May's options? She said ministers had agreed that the referendum "must be for Scotland's national legislature to shape". She added: "It should be up to the Scottish Parliament to determine the referendum's timing, franchise and the question. "There should be no strings attached, no blocking mechanisms applied and no Downing Street diktat - Scotland's referendum must be made in Scotland. "That was the exact description the UK government themselves used ahead of the 2014 referendum, and the same principle should apply now." Two important questions arise from Nicola Sturgeon's announcement that she will seek a second independence referendum. First, do voters in Scotland want a second referendum? And second, how might they vote if an independence referendum were to be held any time soon? During recent months a number of polls have asked people in a variety of different ways whether there should be a second independence referendum within the next couple of years. They have all obtained much the same answer. Around a half say there should not be, while between a third and two-fifths say there should. Speaking in the Commons on Tuesday, Mrs May said the UK government had been "working closely with the devolved administrations, including the Scottish government" on Brexit. She said: "This is not a moment to play politics and create uncertainty - it's a moment to bring our country together, to honour the will of the British people and shape for them a better Britain." Ms Sturgeon will seek Holyrood's backing for her independence referendum plan at the end of a two-day debate in the Scottish parliament next week. The Scottish government said it would allow MSPs to debate the issue on Tuesday and Wednesday before putting it to a vote. Ms Sturgeon wants parliament to give her the authority to ask Westminster for the power to hold another referendum. A spokesman for the first minister said the Liberal Democrats had pressed for the second day of discussion. The Scottish parliament's business bureau - which agrees Holyrood's agenda - is expected to approve the timetable. The first minister said on Monday that she wanted a referendum to be held between the autumn of 2018 and the spring of the following year. The indyref2 campaign is already under way. Did it ever stop? Will it ever stop? The arguments now are political and constitutional. But what about the economic part of the debate? It mattered a lot last time. It will matter a lot if there's to be a next time. The sound of battle will be familiar, but significant parts of the weaponry have changed. If the combatants have any sense - by no means guaranteed - they'll have learned what worked in 2014, what risks being overworked, and what to avoid next time round. The BBC's Scotland editor, Sarah Smith, said the prime minister could refuse to allow another vote on independence before Brexit is completed in two years' time. That would allow the UK government to avoid having to fight on two fronts by negotiating a deal with the EU in the midst of an intense independence referendum campaign. Formal negotiations over the timing of any referendum will not begin until after the vote in the Scottish Parliament on asking the UK government to grant a Section 30 order. The order is needed for the result of the referendum to be legally binding. The minority SNP government is expected to win the vote with the support of the pro-independence Scottish Greens. On Monday, SNP deputy leader Angus Robertson had earlier said that the prime minister should not try to block plans for a referendum. 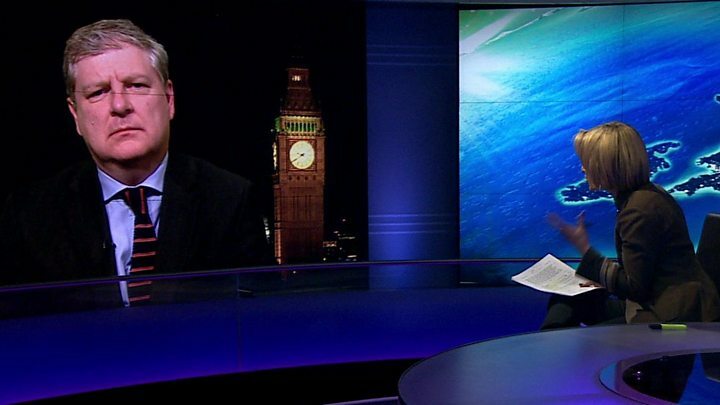 He told the BBC's Newsnight programme that he did not want to "sit in the back of the Tory Brexit bus... and see the prime minister drive us off a Brexit cliff". The UK Parliament passed the Brexit bill on Monday evening, paving the way for the government to trigger Article 50, which will begin the formal process of leaving the European Union. The bill is expected to receive Royal Assent and become law on Tuesday, which leaves Mrs May free to push the button on withdrawal talks - now expected in the last week of March. Do voters in Scotland want a second referendum?